Pappula podi is a versatile spiced powder that enhances the flavor profile of vegetarian dishes lending them a unique taste. 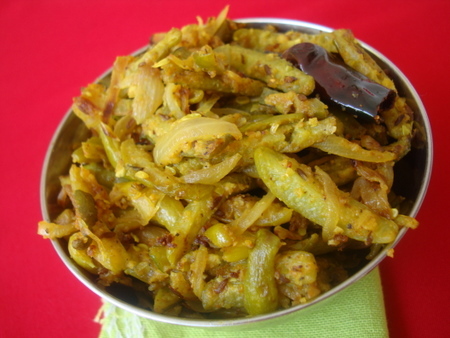 Most vegetables on the likes of okra, eggplant, ivy gourd and bitter gourd taste remarkably good when seasoned with Pappula podi. Constituents of this magic potion aka Putnala podi are roasted chick peas, dry coconut and red chili powder. 1 Wash dondakayalu and nip the tip and tail ends. Slice them into thin pieces and keep aside. 2 Heat a heavy bottomed cooking vessel, add oil, once hot, reduce to medium flame. Add cumin seeds and curry leaves and fry for a few seconds till the aroma emanates the kitchen. 3 Add the dondakaya pieces and saute on medium heat for 3 mts. Add the sliced onions, reduce to low flame, place lid, let it cook, approx 15 minutes. Keep checking in between, sauteing them so that they don’t burn. The sauteed tindora will lose moisture and begin to have a wrinkled appearance. Remove lid at this stage and saute on low for 7-8 mts. 4 Add salt and turmeric pwd and mix well. Saute on medium heat for 5-6 minutes, keep sauteing so that it doesnâ€™t burn. Add red chilli pwd and coriander pwd and mix. Cook on low-medium flame for another 12-15 mts, without lid. Add pappula podi and mix well. Turn off heat. 5 Serve hot with steamed rice. Sailu, A silly question — when you say roasted chickpeas, do you mean dalia or dried chana? The recipe looks yummy, so I thought I’d confirm. Its not a silly question, Saritha. I should have been more specific. 🙂 Its dalia/putnala pappu. could you dry-roast besan in a dry fry pan instead? My grinder doesn’t work well with chickpeas at all. You need to use roasted chickpeas powder and not besan (chana dal pwd). Sailu, Thanks for the prompt reply 🙂 Can’t wait to try out this recipe. Go through the ingredients list for ‘pappula podi’ recipe, Jyothi. You have to use Putnala pappu/roasted chickepeas only. I liked the curry. I am getting plenty of fresh Dondakayalu from my garden. I tried all your recipes this summer.All of them very good.This one is really good. hi sailu….happy to see u back in site.hope all is well. i missed ur recipes a lot. and wht happened to kidszone….please update ….Iam very much got addicted to ur site…bye n take care. I tried this Recipe and its very tasty. Specially Pappula podi is good combination. Love this with dal and rice. Hello sailu, thanks for great recipe. I tried it and came out very good. I am here after a long time, how have you been Sailu? I made this particular one so many times, because this is my son’s favorite and of course whole family. If I cook my old fashioned dishes whole week, my husband asks why don’t you make any of Ms Shalaja’s dishes. Thank you so much. I REALLY LIKE THE VARIETY & SIMPLICITY OF YOUR RECIPIES. I AM A BENGALI WHO WAS WAS BORN AND BROUGHT UP IN ANDHRA. I M NOW IN KOLKATA ND TRY TO REPRODUCE ANDHRA DISHES, WHICH TASTE AUTHENTIC TELUGU TASTES THNKS TO YOUR RECIPIES. I AM LOOKING FOR A CURRY RECIPE INVOLVING BRINJAL & URAD DALTHAT I USED TO RELISH DURING MY HOSTEL DAYS. CAN U POST IT? Hi I tried this recipy it came out very nice . Pappula Podi can we store this powder for few months ?